You and your colleagues are invited to submit proposals for Spectrum 2011. Spectrum is the annual educational conference of the Rochester Chapter of the Society for Technical Communication (STC). STC is an international professional organization that seeks to promote education, communication, and shared resources among communications professionals such as instructional designers, writers, web designers, graphic artists, social media developers, and others who deal with technical information. Who attends and speaks at Spectrum? Spectrum is a regional professional conference and generally draws attendees from New York, Eastern Canada, and surrounding areas. Attendance in past years has normally ranged from 100-180 attendees. This year will be the chapter’s 52nd consecutive Spectrum conference, making it the longest running STC chapter conference. Speakers are selected from local presenters and speakers from around the country who have expertise in subject matter relevant to technical communications professionals, and pertinent to the conference theme. When and where is Spectrum 2011? This year’s conference will be held on April 1st at the Rochester Institute of Technology, in the Center for Integrated Manufacturing Studies (CIMS) located at 111 Lomb Memorial Drive, Rochester, NY 14623-5608. For more information, visit the STC-Rochester website. I’ve participated in this conference for a number of years and helped organize it last year. We consistently receive high marks from participants and have been told that the conference is every bit as valuable as the larger international conferences. I had the pleasure of presenting the following presentation to the Rochester Regional Library Council on Oct. 25th. It contains general Internet and computer safety tips and is slightly modified from a session we provide to faculty and staff at RIT. Having trouble with security awareness at your university or college? Need some new ideas? Trying to figure out what to do for National Cyber Security Awareness Month? The members of the EDUCAUSE Higher Education Information Security Council (HEISC) Awareness and Training Working Group have created some wiki-based resources to help you with your security awareness initiatives. We’ve created two main resources. The Quick Start Guide (https://wiki.internet2.edu:443/confluence/x/sRpG) provides ideas and resources for launching a security awareness program. Topics range from establishing an Information Security Awareness Program to different techniques and vehicles for “getting the message out.” The Quick Start Guide is useful for both beginning and advanced security awareness programs. The Detailed Instruction Manual (https://wiki.internet2.edu:443/confluence/x/yBpG) provides additional topics around selected security awareness initiatives including campus-specific efforts and tips on communicating specific issues. Check out these resources. The A&T Working Group is delighted to share their ideas with you and they’re there to help you be successful. They have a wide range of expertise and they believe you’ll find these materials valuable. The task of creating a culture of information security awareness in higher education can be a daunting one. You may feel as though your efforts are unnoticed and unrewarded. However, one of the really cool things about working in higher ed is that universities and colleges are often willing to share their best practices and even the materials they’ve created. This can ease the burden of coming up with new ideas to to help increase user awareness of information security threats. Unsure of how to best combat the threat, we formed a team of our best information technology and information thinkers to address the issue. We chose a multi-pronged approach with both technology and people initiatives. We increased our email alerts and advisories to inform the community of the problem. Our Information Technology Services organization began prepending a warning message to all incoming emails that contained the word “password” in the text. However, we knew that this wouldn’t be enough to solve the problem. One of our coop students had worked the previous summer at Yale University and showed us phishing awareness posters that they had created. We received permission from Yale to modify the posters for our own use and began a poster campaign on campus. We decided to go a step beyond. What better way to draw attention to phishing than having a giant “phish” walk around campus! Phishy was an instant hit. Phishy visited offices around campus and greeted students with cards that reminded them to NEVER respond to requests for their passwords. 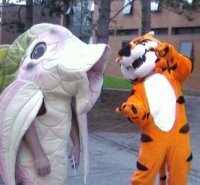 Phishy hung around RIT for a week twice during 2009. Building off of each others successes has enabled both universities to create innovative security awareness programs.